When it comes to achieving affordable, environmentally sustainable and secure energy systems, a group of small economies is quickly accelerating away from the rest of the world. The top 20 performers in the fifth annual Global Energy Architecture Performance Index Report 2017 have achieved twice the average increase in their score compared to that of all other countries. The report, developed in collaboration with Accenture Strategy and launched today at the European Commission, ranks 127 countries based on their ability to provide energy across three dimensions of the “energy triangle”. It finds that the highest performers, which are primarily smaller countries and advanced economies, can overcome constraints if supporting policies are in place. According to the findings, the world’s biggest energy consumers struggle to take leading positions on the index as they grapple with inherent challenges of their large, complex energy systems and are outperformed by more nimble economies. Overall, some of the largest consumers of energy such as China (95th), India (87th), Japan (45th), the Russian Federation (48th) and the United States (52nd) have either slipped in the rankings or experienced only marginal gains. The top 20 performers on the 2017 index represent a diverse mix. European countries lead the index, with Switzerland (1st) and Norway (2nd) taking the top spots. 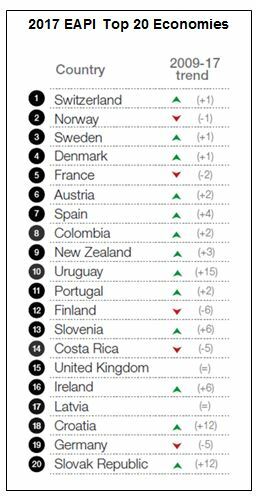 But other regions also hold high-ranking positions: Colombia (8th), Uruguay (10th) and Costa Rica (14th) are the highest-ranked Latin American nations, while New Zealand places 9th. While many of the top performers are smaller countries, both by gross domestic product (GDP) and population, some larger countries including France (5th), the United Kingdom (15th) and Germany (19th) have effectively managed complex energy sectors alongside large economies. The presence of European nations among the top-ranking countries reflects advantages gained through a long history of coordination within the region. “I welcome very much the World Economic Forum’s initiative of the Global Energy Architecture Performance Index (EAPI). Its objective to examine the progress of the global energy transition towards more sustainable, competitive, secure and affordable energy systems matches very well with the objectives of the Energy Union strategy. The fifth edition demonstrates well the unprecedented structural changes in the global energy system. Europe, with its clean energy transition, has embarked on an ambitious path to lead this goal” said Maroš Šefčovič, Vice-President of the European Commission in charge of the Energy Union and launch partner of the report. When comparing this year’s average Global Energy Architecture Performance Index to that of 2009, only a modest improvement has been made. However, a number of stand-out performers have climbed the ranks in this time frame by making significant improvements to their energy systems. These include Jamaica (116th to 92nd), Nicaragua (95th to 72nd), Tajikistan (66th to 46th), Mexico (59th to 44th), Luxembourg (37th to 23rd) and Uruguay (25th to 10th). The report studies a selection of the top performers, as well as the biggest upward movers, and reveals three principles for generating improvements in energy sectors. Frame the long-term direction for the energy sector, and commit to it: Governments with long-term visions provide important continuity across these extended time frames. A clear frame and long-term direction are seen to form the basis of policy goals and provide a sense of stability required to encourage investment. Enable the energy transition with adaptable, co-designed policies: The policies most effective at advancing a country’s energy transition are those which enable solutions that best suit a country’s context. This means creating the necessary opportunities for innovation to flourish and providing flexibility for the most appropriate technologies to emerge organically. Steward investment towards the areas with most impact: Significant investment is required to make progress on the energy transition and to meet growing demand for energy. The stability of committing to a long-term vision is a must for establishing investor confidence. Stewardship of investment then directs the capital required to support the energy transition to the right projects that will drive progress.